Where did House of Women start? The story began with the 1947 film Black Narcissus, about a group of nuns that start a school in the Himalayan mountains. Both the visuals and acting are hyper-stylized are there are a lot of astonishing set pieces, backdrops and crazy emotional highs. It just really struck me. I thought about reworking the story into a science fiction context and the story evolved from there. I don’t know if I was thinking about this at the time, but in retrospect the movie Splice played a big role in the development of House of Women as well. It’s a science fiction horror thriller that came out five years ago and one of the central story points from House of Women was more-or-less adapted from that. The book is basically a mishmash of stuff I really like. I had done some short stories for anthologies that were in a 1950’s retro science fiction style and looking at Black Narcissus and those great flowing nun outfits I wanted to do something that hearkened back to an even earlier style. I had always been a big fan of Aubrey Beardsley so he was my starting point, and from him I hopped to the other illustrators and painters working in the same period. Art nouveau artists like Mucha and Klimt. From there I went back to the original source material which inspired the art nouveau movement, which was the Japanese prints that were imported into Europe. I did the book over four years. 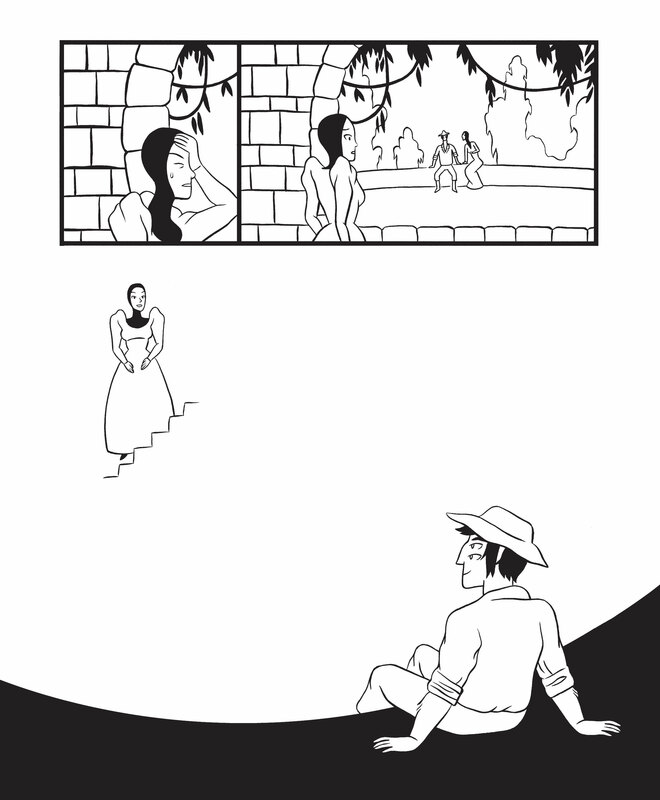 If you look at the settings, such as the castle and Jael’s home, you’ll see way more of a European influence in the first issue, or “Part I” in the book. By the third issue (“Part III”) most of my visual influences were from Japanese art and Islamic architecture. Readers rarely see the changes that artists tend to perceive in their own work. 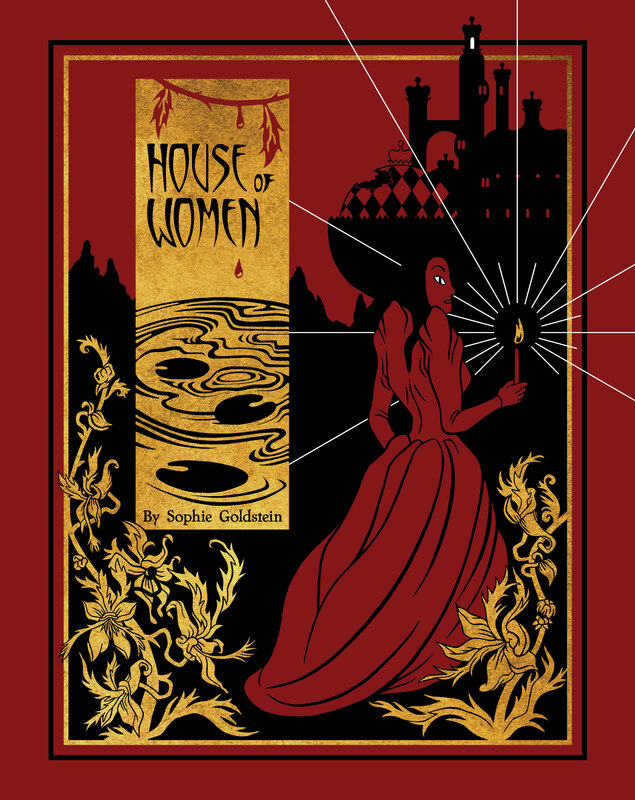 I think the difference between the first pages and the last pages of House of Women are very stark, but for good or bad that’s not what a reader sees. I definitely think there’s a difference and a large part of it was taking on more of the vocabulary of Japanese printmaking. I know what you mean. You have a scene at the end of the first issue with Sarai and Rhivka watching Jael and on rereading the book, I thought that based on how you drew the second and third parts, you would have depicted that scene very differently. The book looks and feels very differently than The Oven. One thing I’ve learned is that part of style is just artists learning to draw what they want to draw and finding a way to avoid what they don’t want to draw. That seems totally correct to me. When I’m trying to figure out how to draw something that’s difficult often the best way to solve these problems aren’t by looking at photos of that object, it’s by looking at the ways that other cartoonists have found to translate those ideas, settings or objects into images. It’s really just a bunch of visual short cuts. That’s what style is, really—your unique visual language. 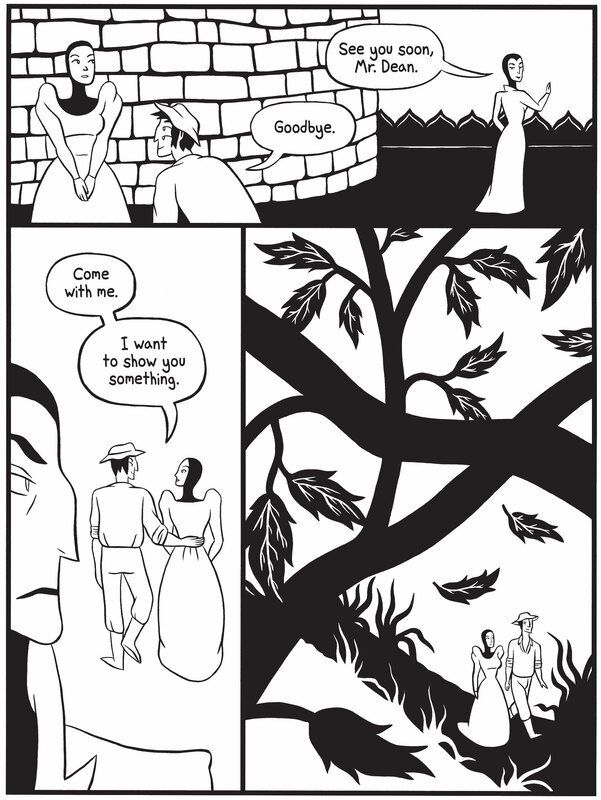 Talking about the natural world, I kept thinking of the third chapter where Rhivka starts to almost resemble the landscape in some ways and there are these almost expressionistic scenes with her. Normally, when I draw humans, I tend to keep their faces and their acting pretty minimal. Harkening back to Scott McCloud’s ideas, the simpler the face and the figure, the more the reader can identify with that character and place their own emotions into the character, whereas if you have a really detailed face with a lot of emotion, it creates more of a distance between the reader and the character. In House of Women the viewpoint character, for the most part, is Sarai—and so her face is just boring. [laughs] I got so tired of drawing her. Her mode of expression is pretty limited. With a book like The Oven, that’s pretty much true of all the characters—I wanted the reader to feel for and identify with all of them. So, I even limited the iconography. Instead of having more detailed eyes they just had little dashes. Rhivka is my favorite character, both visually and personality-wise, and she’s not a viewpoint character so I got to get really crazy. Drawing those last pages with her at the end were just pure fun. Really being able to push her body in those scenes to the edge of being cartoony was fantastic. Honestly, I wouldn’t have identified it myself, but now that you’ve pointed it out I can see that it was the same kind of expressiveness that I used in the landscape. You can draw a tree in so many different ways, but there’s a limit to how many ways you can draw a human face before it stops looking like a face. Sarai can be frustratingly closed off, but you have this cast of characters who look very different from each other. Part I of House of Women was my thesis project for CCS, so I had an unusual amount of development time. One of the things that I did early on was decide that each of the characters were aligned with an element. It’s not something that ever comes up in the story, but it played into the characters’ physical appearances and personalities. There are panels in the book where you can see them in their element. Sarai’s element is water and so you see her in water a lot. It’s also mentioned that she’s from a planet that’s mostly ocean. Aphra, whose element is wood, is very tall and has a lined face, like a tree. At one point she tells a story about her home—a giant tree planet. Rhivka is fire and she has little points on her costume and face and hair—she’s basically made of points, like flames. Thinking this way helped me make a more visually diverse cast, with distinct shapes and personalities. In animation each character has to have a very defined silhouette that differentiates them from other characters and I think that’s a really great rule of thumb for cartooning as well. We’ve been talking about how to altered your style for the book. Did you use a brush to draw? In addition to the art nouveau influence, House of Women is the first time I used a brush to ink. The whole thing is inked with an honest-to-god brush, with bristles and everything. Very time-consuming. [laughs] I would draw a page in an hour and a half and it would take me three to four hours to ink. My style is super clean so I can’t really rush it. Brushes are temperamental, but you can’t get that level of line flexibility with a pen, which is what I had been using up to that point. I don’t really anticipate going back to the brush any time soon, because it takes so long, but I’ve been experimenting with pens that have a more flexible tip. I’ve developed an affection for the brush tip pens from zebra, so I’ll probably use those to ink my next project. It was announced a little while ago that you have another book in the works, An Embarrassment of Witches. I love the title, by the way. Is this the book that you and Jenn Jordan have been working on? Yes, Jenn and I have been working on that for over two years. It took us a really long time to write it because of, well, life. It’s going to be a really big departure from The Oven or House of Women. 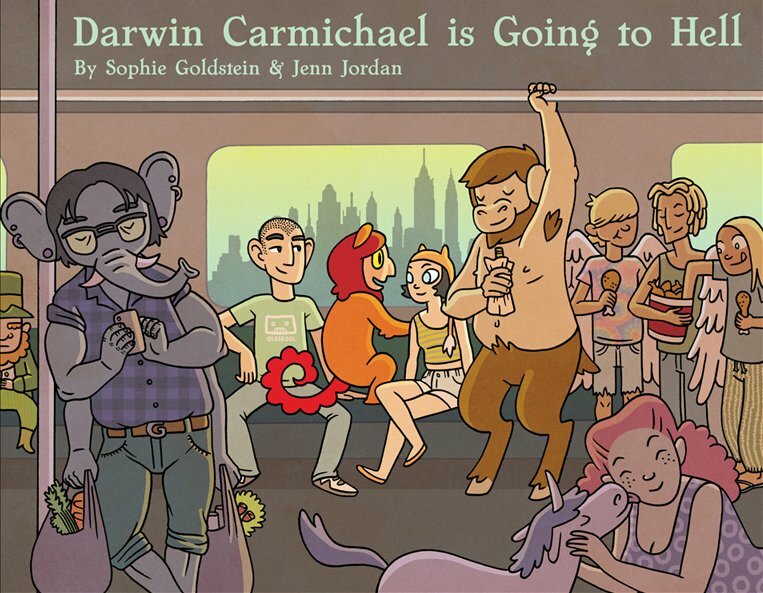 If you’ve read Darwin Carmichael is Going to Hell, my previous project with Jenn, you know how different the tone of that book is from my solo work and so this is a return to that. It’s a funny, slice of life comic. A post-collegiate coming of age story about trying to navigate that weird period right after you graduate college but before you have figured out what you want to do with the rest of your life. The script and thumbnails are done, so basically I just need to sit down and draw the book. I’m really looking forward to it because humor is just fun to draw. 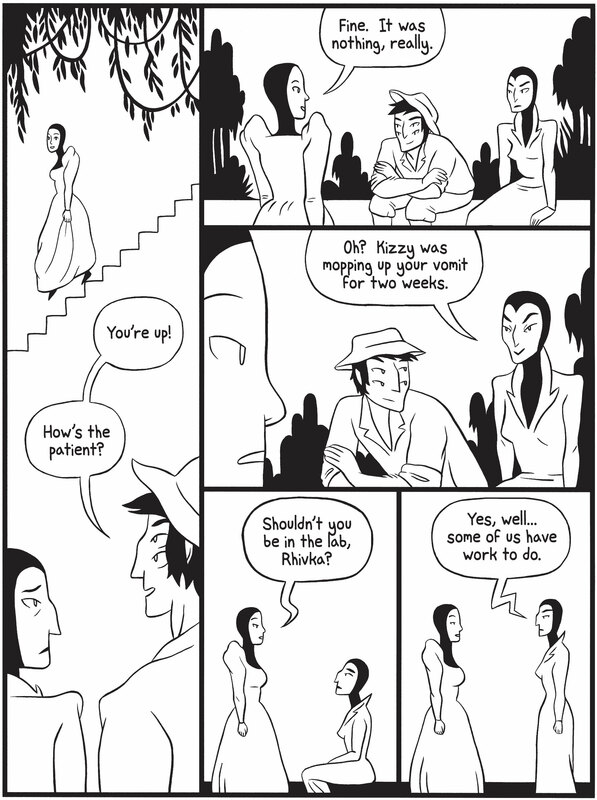 The kind of leeway that I had with Rhivka in House of Women is not dissimilar to the amount of flex I’ll have with faces and bodies in a humor comic. The acting can be broader and sillier, and I can be a little more inventive than when I’m doing serious drama. An Embarrassment of Witches will, theoretically, be out in the world Winter 2019. So you’re spending next year drawing that book? Yes, next year will just be drawing that and probably doing some freelance as needed to make ends meet. It’s hard to support yourself between books. That’s always one of the challenges of being a cartoonist. Speaking of other stuff, I really did enjoy the piece you did for The Nib, Downsizing Your Problems Away. I’m glad you liked it! I had to rewrite that piece five times because I couldn’t figure out what I wanted to say. Ultimately, I ended up throwing out this very straightforward nonfiction piece and writing what was in essence a screed. I was really happy with how it came out, but it was very different than what I pitched to them. Nonfiction or essay form comics are not really my forte, although non-fiction is a really hot genre right now. You had to reframe your expectations. [laughs] It was fun. I did another fun piece recently that just came out in the November/December issue of Cicada Magazine. It’s only six pages and it’s about this girl who freelances for a company called AppApp, which is an app to manage your apps. It’s basically a satire of the sharing economy and the way that that mentality has penetrated our lives and relationships. It was another piece where it took me a long time to arrive at the story I wanted to tell, but I’m happy with the result. I also enjoy thinking about the near future things and the ways that technology is impacting our lives and decisions. That Nib article and this the piece for Cicada allowed me to delve into that a little bit and also be funny—which is not something that there’s a lot of in House of Women or The Oven. You’re always interested in character and I can see how these pieces which were about a concept might take you more time because it means starting in a different place and having to approach the piece differently. That’s totally true. For me, there’s no story without characters. I think of the science fiction environment as a way to explore relationships. You’re exaggerating and pushing different issues through world-building. In House of Women, the women are very isolated from their own culture and in a very hot environment where everything is very rich and sensual and it brings up these feelings inside themselves. In The Oven, I was exploring the moral choices that people make within relationships and within society. I would never do an Asimov-style series like The Foundation, where he tracks one technological culture over hundreds of years and characters come and go. A limited scope is much more interesting to me, and as a reader and viewer of science fiction, that’s the kind of story I’m really attracted to. Stories that have really strong characters and not just a character that exists to give you a lens on a world, which is something that’s often true of hard sci-fi. I was going to say, you were probably really influenced by Ursula Le Guin and Samuel Delaney and the New Wave Science Fiction writers. Le Guin’s Left Hand of Darkness is one of my favorite science fiction books. I also love The Sparrow by Mary Doria Russell. When I was a teenager I read The Time Traveler’s Wife and that book had a huge impact on me, as was the movie, Eternal Sunshine of the Spotless Mind. In both of those stories the sci-fi conceit is a vehicle for exploring the romantic relationship between the two main characters. I just think that’s really compelling. I haven’t gone back and read The Time Travelers Wife, and I’d be afraid to now because people talk about it as being cheesy and I would hate to destroy how much I loved that book. There’s a lot of really good science fiction out there. Because it’s genre work, you don’t often hear about it unless your a sci-fi nerd. That is, until a movie gets made of it and then a more general populace will read it. But aside from that, you have to dig a little. You serialized House of Women in three parts over a few years. Do you like serialization? It was a matter of necessity, really. I did Part I for my thesis project and then I took a two year break between Part I and Part II. During that time I pursued a lot of anthology work and I was working on House of Women when I had time for it. I think for my purposes at that time, serialization worked pretty well. From a financial standpoint, selling a series is a challenge. I sold a lot of Part I, somewhat less of Part II, and I still have a lot of copies of Part III. That’s pretty normal. The more issues you have, the worse it gets. From that viewpoint I don’t know if it’s a great blueprint for having a financially supportive practice. Ideally, what I would like to do is have the time and financial stability to be able to do a whole book and release it all at once, because that’s the way that I prefer to consume things. When I was in college, I read a lot of comic book series, and I would go to the shop every Wednesday. That was fun, but now I read novels and graphic novels and I enjoy works that are long enough that I can really sink into them. That’s the experience that I want my readers to have. You want to immerse yourself in a project like your ideal reader does. Yeah. 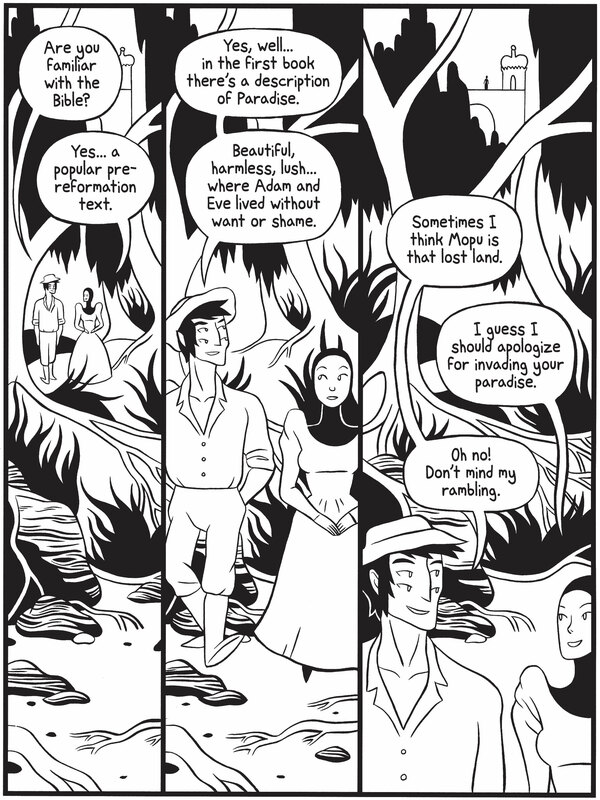 That being said, I have permission from my publisher to serialize An Embarrassment of Witches on my Patreon. Some people love that, getting a couple pages every week and being able to follow the story and give their two cents. Actually, I’m very excited about returning to the webcomic format, because I really enjoyed having that level of intimacy with my readers, but it’s also a matter of necessity. I need to support myself making this book and there are people who want to read it before the next two years have come and gone, so I’m giving them that access and in exchange they’re giving me money. It’s a symbiotic relationship. You’ve been making short comics for a lot of different outlets. Have you been thinking about putting together a collection of your short work? I think that would be great. I’m really proud of my short comics and if they’re not collected there might not be a way for people to access them in the future. They were done for different publications so they’re a bit all over the place. 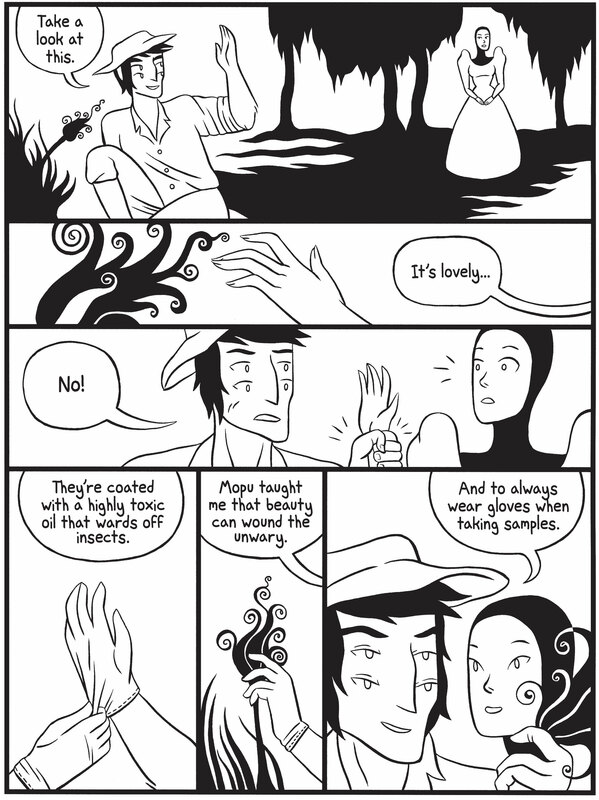 I do wonder about visual and thematic coherence, but when I read Eleanor Davis’ How To Be Happy collection I see thematic threads between the stories because, although they were created for different publications and in various styles, she’s one person with one set of interests. I think it’s harder for me to see any thematic coherence from inside my own limited perspective than maybe an editor or reader. If that should happen, whatever person I end up collaborating with on a collection on will hopefully guide the whole thing better than I can from my own self-critical standpoint. A collection would be cool, in summary.